About Translation: "Name your price" or "Find a sucker"? The customers send details of their translation project to receive a quote. The quote is calculated considering the lowest bid estimated for the project. If the customers still thinks that's too much (and who won't, at that point?) they can "Name their price". The customers place their order, and automatic bidding starts. Once someone desperate enough to work at the price set by the customer (or lower, I imagine, to "win" the bid) is found, the translation supposedly gets done. If they cannot find a translator willing to work for peanuts (but I bet they will: "There's a sucker born every minute", as P.T. Barnum used to say), then they say the customer gets a refund. I believe that translators should set their own rates, and I'm not one to rail against those who set their rates lower than mine. But a scheme like this drives the customer to set a price lower than the minimum estimated quote, then pushes competing translators to go ever lower in the illusory hope of getting some work. You have GOT to be kidding me?!?! What bottom feeders! Hopefully they will lose their clients since the quality will lack. It continues to amaze me that any company would consider hiring a worker (even a temporary one) in such a way. They would never hire their accountants or secretaries etc. through a lowest wage bidding auction, so it's disturbing that they seem to feel no shame in treating translators as sub-human. Well, at least if nothing else, it's a good way of identifying companies to stay far away from. "How come there is more translatable content and yet price per word is continuously declining..."
Well, they are certainly deserving of the #bottomfeed tag on Twitter. I wouldn't worry much about trash like this, however. They are stuck in a part of the bog from which they and anyone who plays their game are unlikely to escape. Clients get what they pay for. What goes around, comes around. Oh, we got this one, too. For once, we are pretty speechless. Agreed on the #bottomfeeder tag -- describes them very accurately. Thank you for the comments. I respect all of you and read your blogs. I'm really sorry that neither Riccardo nor any of the readers who found time to write "lovely" comments, did not find time to notify me of this post or contact me personally instead of posting your "compliments" here. I'm always open to constructive critism but I do not support and will not use the language or attitude some of you have used. I'm going to refer to most of the issues you have mentioned. If you have more questions, pls contact me personally. 1. Customer Wise - Many of our customers choose our standard quote and those who choose to set their own price usually take off just a few percents. If any of you actually checked "Tomedes Name Your Price", he/she could see that we do have a lower rate limit which is still higher than the one offered by many translation services (I rather not mention their names here). We keep getting great feedback from our customers who are satisfied with the feature. 2. Translator Wise - Translators are getting to see random paragraphs out of the source document, the customer's guidelines and the deadline before placing a bid. 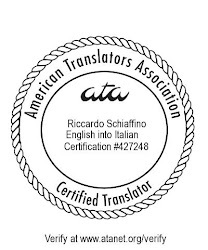 In the bidding proces we also take into accound the quality of the translator so that a combination of quality and rate determines the awarded translator. Unlike online translation marketplaces, there is no fee or commission charged from the translator and they do not need to waste their valuable time negotiating with customers. 3. Quality Wise - We respect all translators but have zero tolerance to quality issues. We employ quality assurance tests to make sure the custoemr gets a perfect translation. The chances a translator who delivers a low qualilty translation will get another job at Tomedes are very low. Thank you for your comment, Ofer. I apologize for the intemperate wording, but would like to reiterate that reverse auctions, by their nature, push prices downward (see my "Reverse auctions" post). Ah, so now I know which company you were talking about Riccardo. Ofer or one of his colleagues contacted me some time ago and asked me to review an e-book from Tomedes and offered to do a guest post. I approached the offer with an open mind, but when I actually read the e-book, I was absolutely appalled at the business model and some of the advice dispensed to translators. I forwarded copies to two colleagues - one in Germany, the other in Canada, and I think one of them referred to it as "evil" or something along those lines, while the other was merely deeply offended. So while I do not wish to give personal offense to Ofer, whom I don't know and who might be a perfectly decent fellow with good intentions, I do not approve of the company's practices as described by the company itself. Telling translators to restrict the number of clients they deal with is very self-serving for Tomedes and extremely bad for the translator's risk distribution as anyone with a bit of sense can understand. After reading that e-book cover to cover many months ago, I can most certainly endorse the use of the #bottomfeed tag (not #bottomfeeder, we're trying to save a few characters). I personally dont see this special deal lasting too long. Eventually, clients will notice they are paying exactly what their getting; low rates, low quality. I can see if this deal is only offered to specific clients then it would probably work out. I'm afraid this kind of practice, rather than acknowledge the value of the work, may eventually reinforce the image of the translator as an invisible, will-work-for-peanuts professional. "We employ quality assurance tests to make sure the custoemr gets a perfect translation." If your translations are as perfect as your post, I guess you need to "employ" more effort to further improve your already perfect quality. BTW, a few weeks ago I started recruiting translators for a new, small agency. While I didn't mention rates at all, most were in the range of USD 0.03-0.05 psw. And I even got an application for less than 2 cents. they did not pay me anything, they said that I could do a proof reading but the translation was made by someone whose first language is Portuguese and it looked like a "Google translation" and was not at all coherent, so I basically had to make a new translation. Then I did not get anything for it and I mailed to them and asked when I was going to get the 33 dollars but they did not reply.